What Types of Tarantulas Live in the United States? More than 50 tarantula species are native to areas of the United States. This includes all or parts of New Mexico, Arizona, Texas, Oklahoma, Colorado, California, Nevada and Kansas. There are also several tarantula species in the United States that are unknown to science. Tarantulas, a member of the Family Theraphosidae, are beneficial to humans because they help control the insect and rodent population. While tarantulas, the largest of all spiders, may appear fearsome to some, they are also kept as pets in many homes. Tarantulas found in the United States generally have an appearance and anatomy that is similar in a number of ways. The hairy body and legs are tan or a reddish brown to black color, with a body size up to three inches long, up to three inches tall with a leg span of up to five inches. Males are longer and slimmer than females with a much smaller abdomen. The outer shell, also known as an "exoskeleton," is made up of a fused head and thorax with both connected at the waist to the abdomen: the abdomen contains a number of vital organs and silk-producing spinnerets. Eight eyes are on the forehead, two pedilaps for handling food are near the mouth, and four pairs of legs connect to the head and thorax. Mature tarantulas molt a number of times by throwing off their old exoskeleton. Males can live for several years while females live for several decades. Oklahoma brown tarantulas, also known as Texas brown tarantulas, are found in Oklahoma and northern Texas. Of the nearly 900 known species in the world, the brown tarantula is second in distribution only to the black tarantula. The Brazilian black tarantula, for example, is a very common black species. The Oklahoma brown tarantula lives under flat stones and in shallow burrows. Brown tarantulas are generally more docile than the vibrantly colored species. Sexual maturity is usually reached by 10 years of age. Females have a life span of about 36 years and males live from seven to 12 years. The medium-sized spider is stocky and covered in fine hair in different shades of brown. The diet is made up of crickets, locusts, grasshoppers and meal worms. Desert tarantulas are generally found throughout the southwestern United States, mostly in New Mexico, Southern California and Arizona. Nocturnal and reclusive, the desert tarantula hides in burrows or under rocks during the day to prevent being preyed on by snakes and birds. When young, all tarantulas resemble females and it takes about eight to 10 years for both to reach full sexual maturity. Food choices include crickets, grasshoppers, cicadas, caterpillars and lizards. The solitary desert tarantula makes no sound and like most tarantulas, has poor vision and communicates primarily by touch. Most American tarantulas have urticating hairs. The barbed and slightly venomous hairs are found on the abdomen, and legs are used to throw these hairs into the face and eyes of any animal perceived as a threat. Fangs are also used to inflict a bite. Fangs of the tarantula move up and down while the fangs of other spiders move in a horizontal fashion. While it may be painful and irritating, the hair and fangs do not appear to cause long term harm. Carolyn Green has been a freelance writer since 1989. She has written for BETweekend, Good Old Days, Baby's World and more. A teacher from New York, she also taught in Seoul, where she wrote for a Korean publication. Her passions include world travel, nutritional research and alternative medicine. She holds a Bachelor of Arts in English literature from State University of New York, Old Westbury. 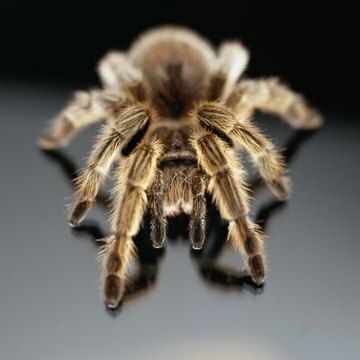 What Gets Rid of Tarantulas? What Spiders Have Blue Markings? What Kind of Mouth Does a Spider Have?